How can we eliminate a large-scale infestation of invasive ants – and how would we know when we have? Argentine ants are considered to be one of the 100 worst alien invasive species on Earth. Over the past century, they have spread from their native range in South America to six continents and many islands around the world. In California, these ants have established super-colonies hundreds of miles long, stretching from San Diego to the Oregon border and beyond. The ants are considered a major agricultural pest, and a nuisance when they invade homes. Where Argentine ants occur in conservation areas, most native ant species simply disappear, and that can have significant, cascading adverse ecological effects. In the 1990s, researchers discovered that Argentine ants had established on Santa Cruz Island, the largest of the Channel Islands off the southern California coast. The island also harbors 33 species of native ants, the majority of which could be eliminated if the Argentine colonies were left unchecked. By 2010, the island had multiple documented infestations, totaling roughly 1000 acres, many of which were in dense vegetation and difficult to access terrain. One aspect of Argentine ant biology that makes them so hard to control is that infestations comprise an extensive network of colonies. The ants we see are the foraging workers, and most pesticides on the market target and quickly kill them. But unless and until the queens of the colony are killed (and each nest has a succession of queens in waiting), the infestation would be able to rebound with ever more workers. Fortunately, those workers provided us the Achilles heel we needed: their job was to feed the queen. What we needed was a way to get the workers to carry pesticide back to the queens. And that required innovation on a number of fronts. First, we needed to formulate a bait that would be attractive to workers, and that had just the right concentration of toxicant in it so it wouldn’t harm the workers right away, and that wouldn’t raise alarm in the queen when she was being fed that there was something amiss. Second, we need a way to get the bait distributed across the infested zones, so that it would be found by foraging workers from all of the individual colonies. And, whatever approach we used, we needed it to not harm the numerous species of conservation concern on the island, like the endemic island fox and island scrub-jay (both of which have proven themselves quite curious about novel objects in the field, like ant bait stations). 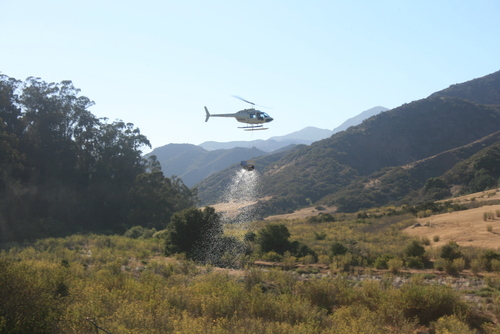 After much trial and error, our scientists – working in consultation with experts from around the world in ant biology and pest management – came upon the solution: a specially formulated low dose of toxicant, mixed with sugar and water, which we encapsulated into small polyacrylamide beads that we could readily distribute via helicopter over the infested areas. It appears to have worked. But how can we be sure? And after a series of applications, and careful follow up monitoring, our method appears to have worked. After just a couple years, we reached a point where we can no longer detect Argentine ants. That lack of detection ushered in a whole new scientific question – and problem to solve. Does a lack of detection mean that they are actually gone, or only that they are at such low abundance they’re hard to find? If it’s the latter and we don’t detect and treat the residual colonies in time, we could easily lose all of the progress and investment to date. But how to find such a tiny invader? Our plan is to sniff them out. 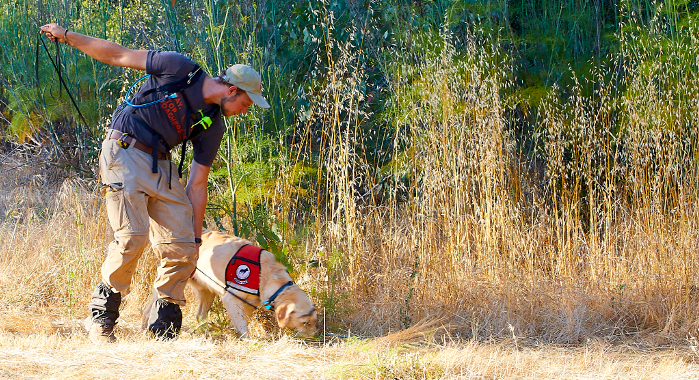 Working with expert dog handlers, we have trained dogs to detect Argentine ants, differentiating them from all the other ants they may encounter in the field. By running these conservation canines through the (formerly?) infested zone, we will be able to increase our confidence that the ants have indeed been eradicated from the island. If the project is determined to be successful, it introduces yet another scientific challenge: how do we reduce the risk of Argentine ants stowing away on a boat or a plane and reinvading the island? That requires robust “biosecurity” protocols, implemented on the mainland as well as the island, aimed at keeping ant, weeds, and other pests and pathogens from gaining a foothold on this highly sensitive and unique island conservation area. 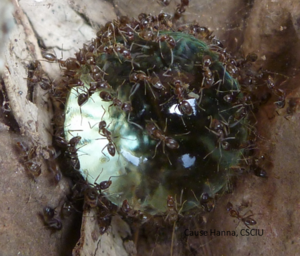 Using methods developed by The Nature Conservancy on Santa Cruz Island, partners from California to Australia are now seeing success eliminating Argentine ants and other invasive ant species from high priority conservation areas. Farmers and conservation land managers worldwide struggle to deal with invasive ant species. Our method has since been used in projects to eliminate Argentine ants and other invasive ants on lands managed by the U.S. Navy, governmental agencies in Australia and Hawai’i, and the San Diego Zoo. Several Napa Valley and southern California vintners have completed trials using our approach and have seen economically significant decreases in insect pests on their vines, resulting in a substantial reduction in pesticide use. We are now exploring how using this low toxicity bait could be applied to reduce the use of pesticides more broadly in agriculture, and stop infestations of invasive ants from establishing in remote Pacific islands where they pose a threat to not just to unique island species but also human well-being.